I made a dress last week! Not the one I've been talking about, but it's a dress I'm really happy with. Just when I thought I'd finally make that Nakamichi inspired dress, something came up, and there was no longer any time for the experimentation and the mock-ups that the dress required. I'd received an invitation, and suddenly I was making a dress for an event and after party; I had a deadline. But I'm used to deadlines and conjured up a Plan B, deciding to sew a dress using my basic sloper. I hoped I'd like the dress enough to wear it. I did! The idea was to combine two fabrics -- a lacy racked rib in wool that I could quickly machine knit for the occasion. (I had originally developed the stitch pattern in bamboo for another project, and I've been experimenting with summer wool for a little while now. 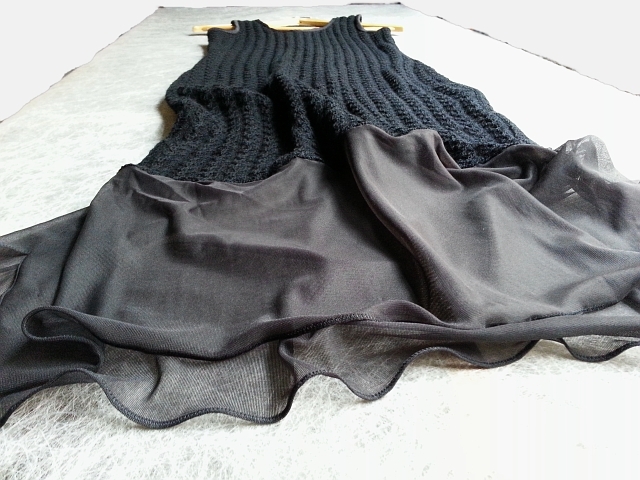 The fabric is lighter than it appears in the photos and very comfortable to wear.) 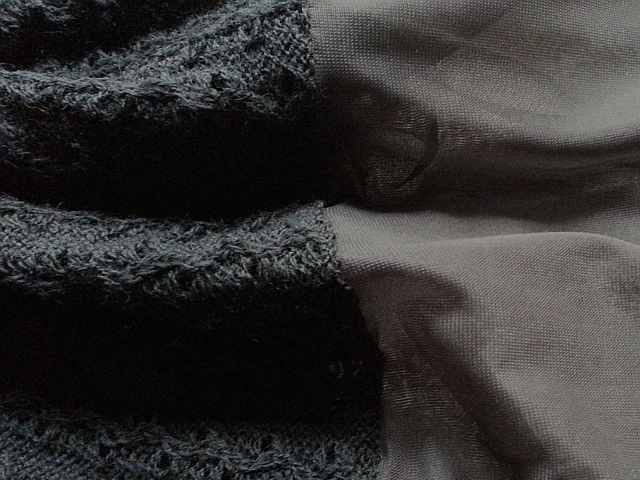 The second fabric would be a sheer nylon knit (store-bought) that I had on hand. The lacy wool would work for a simply shaped, knee-length, sleeveless sweater dress. The sheer would be for bottom panels with a handkerchief hem to mid-calf in the front, and a little lower in the back. 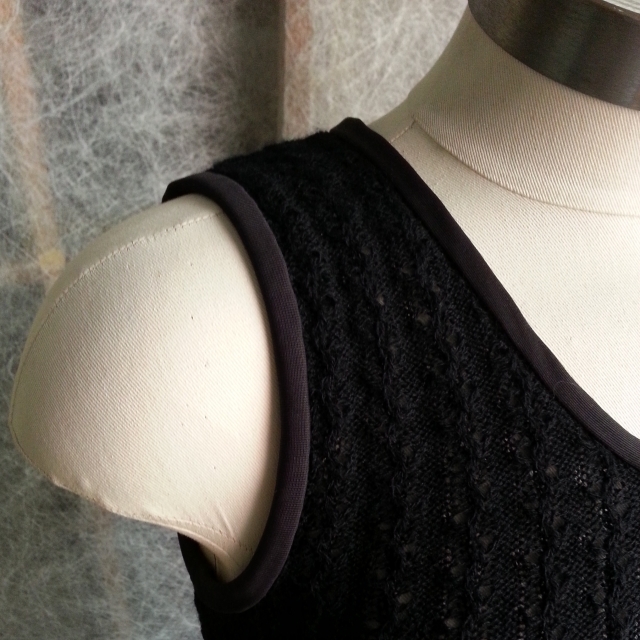 I doubled the nylon for a French binding around the armholes and neckline. I have no modeled photos of the dress at the moment. Maybe I'll have a "Big Photo Session Day" and model all the things I've made lately. Maybe. Photographing from this angle and squishing the dress up a bit gives a better idea of the flow than photographing it on the dress form straight on. As always, there are a few interesting techniques that I'm making note of for my future reference. I'll get into them on the blog soon. The next version of this dress will have a couple of modifications, which I'll talk about too. Ever do last minute makes for personal wear? I had back up clothing so I was willing to take the risk. If you do it, do you think it's worth the pressure? I probably make some of my best outfits last minute. I think I just do better with a deadline and a little pressure when sewing for myself. Thank you, Brooke. I do understand what you're saying about deadlines. I have to make a self imposed deadline sometimes when I'm sewing/knitting for myself!